Hunting Trophy Whitetails in the Real World is more than a how-to book. It also includes stories of successful big buck hunts and the lessons they taught, as well as opinions and advice on various topics related to deer hunting. 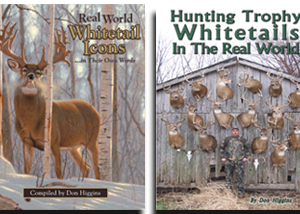 This original classic by Don Higgins sold out of its first printing in less than a year and proclaimed by many as the best whitetail hunting book they ever read. Don details the lessons he has learned from a lifetime of hunting mature whitetail bucks in the “real world”. What is the “real world”, you ask? Simply put, the real world is where most of us hunt. It is not the staged and phony hunts that we often see on TV or on videos which often take place behind high fences or on guided and outfitted hunts. In the “real world”, everyday hunters pursue wild and hunter-wise bucks while dealing with the competition from other hunters. This is exactly the kind of whitetail hunting that Don has mastered over the past three decades. Patterning Bucks – Is it possible? Sanctuaries – Every mature buck has at least one. Early Season Bucks – Don’t overlook this period. Hunting the Rut – Don’t get caught up in hunting sign. Late Season Hunting – Nothing fancy, just persistence. Treestand Tactics – proven ideas. Mornings or Evenings – Which is best? Is There Really a Second Rut? – Don’t be misled. Deer Hunting Ethics – An all too often avoided subject. Foodplots and Land Management – Advice garnered from experience. Deer Huntings Future – Are we headed in the right direction?